Immigration reforms that would replace H-2A visas with an agricultural guest worker program under the U.S. Department of Agriculture would provide growers with a stable, legal work force for the first time in decades, produce leaders say. 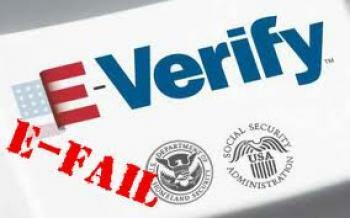 [Gang of Eight] Immigration Bill Shakes Up E-Verify, I-9 and More! These are not the databases you are looking for, Joe Public. BTC - The following is filed under Op-Ed, comments not published at a Seattle Times story: Lawmakers take aim at CIA's use of fake licenses from state. At the moment, local lawmakers are trying to legalise a secret State drivers license program so that local officials can regulate it and keep the license divisions in federal business. If its regulated then the CIA and the Dept of Defense can continue to purchase fake licenses from Washington State. Due to press and lawmaking efforts, this is no longer a secret program. This would put Washington State's fake police licenses in a rather illegal class of unofficiated spending. Drivers license divisions are prone to corruption and internal fraud from time to time. This type of black budgeting at the use and sole discretion of local police officials might be part of a larger trend to militarize police resources, allowing them secretive federal national security powers. 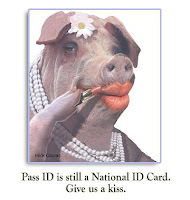 It may even explain more about the recent rash of database adoption for Real ID use, post-NDAA FY2012. When municipalities or State governments are given federal money for secret programs, perhaps for things like Real ID, you might suddenly witness a jedi mind trick or two. This might sound similar to Missouri Senator Nixon's "These-are-not-the-databases-you-are-looking-for," type of statements made recently. If a secret program suddenly becomes outed the public can reasonably call a halt to it because it is an unofficial tax. This leaves a lot of room open for legal debate towards State budgets when they "go black". In the case of Washington State, the only way for DOL to keep their formerly-secret federal funding is to legitimise it with lawmaking, rule provisions or regulation. "Can we please not legalize secret programs?" People around the country are noticing there is a separate local culture of overpriviledged secret government officials. They [like to] pay themselves as much as federal [lawkeepers] and the federal government gets to borrow, use from local or regional resources and keep shadow governance simpatico. The bad news is that most of the rest of the country doesn't want to pay for Washington State's black budget programs. It’s not a surprise that the CIA and Defense agencies just helped themselves to a clandestine police program at Washington’s DOL, for years on end. This isn’t a good standard. While we have to work somewhere, it’s time to forge a moment of conscience. Irons of courage only emerge from the flames of fear. This is a scary precedent, but it only gets scarier for everyone the more you allow clandestine favoritism to prevail. Do you want Washington State to be America’s utility closet for secret programs? Then please raise some substantial objection on legalizing corrupt governance in Olympia. JEFFERSON CITY - U.S. Representative Blaine Luetkemeyer will be talking to lawmakers Monday about how much personal data is being used by the state when Missourians apply for state identification. 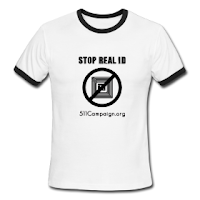 Alaska REAL ID Nullification, Round Two.